This article originally appeared in the Sept. 10, 2018 issue of SpaceNews magazine. If all goes as currently planned, sometime in 2022 a rocket will lift off, most likely from Cape Canaveral, carrying a payload that at first glance will look familiar. The boxy shape and folded-up solar arrays will make it resemble many of the commercial communications satellites launched from the Cape and elsewhere. This payload, though, won’t be destined for geostationary orbit. Instead, the spacecraft will head to cislunar space. 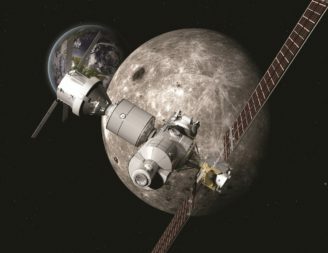 Formally known as the Power and Propulsion Element (PPE), it will be the first component of NASA’s Lunar Orbital Platform-Gateway, or simply Gateway, that will eventually host crews orbiting the moon. The resemblance of the PPE to commercial GEO satellites is deliberate. NASA expects that companies will propose designs based on satellite buses they already build, augmented with advanced electric propulsion systems being developed by NASA. By doing so, the agency expects to get a spacecraft that will be less expensive and faster to build than a custom design, while companies get to demonstrate advanced technologies — and get a welcome bit of additional business during an extended dip in commercial satellite orders. That led NASA to decide to make use of those existing platforms rather than come up with a custom design that meets specific NASA technical requirements. “The commercial satellite industry has a demonstrated reliability. 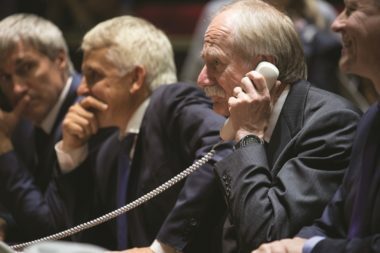 We need to make sure we don’t undo that demonstrated reliability by laying our requirements on top,” Gerstenmaier said. The PPE, as the name suggests, is primarily designed to provide power and propulsion for the overall Gateway. The spacecraft will be required to produce 50 kilowatts of power, of which 40 kilowatts will be available for an electric propulsion system designed to maneuver the spacecraft in cislunar space, including into different orbits around the moon. It will carry 2 tons of xenon propellant for that electric propulsion system with the capability to be refueled. The spacecraft will also support communications with Earth as well as other spacecraft visiting the Gateway and, later, spacecraft operating on the lunar surface. NASA expects companies to use their existing satellite capability for development of the PPE. “We are leveraging not only the NASA capability but also intend to leverage U.S. industry’s current capabilities and industry’s future plans,” said Michele Gates, director of the PPE project at NASA Headquarters, during a meeting of the NASA Advisory Council’s human exploration and operations committee Aug. 27. That capability, she said, will allow the spacecraft to be ready for launch in 2022 even though NASA won’t award a final contract for its development until spring 2019, a schedule some are skeptical about. “I just don’t see any way in the world that schedule will work,” argued one committee member. The three-year schedule, Gates said, is based on industry’s experience in building commercial satellites in that time frame, and previous studies with companies on the PPE. “Our intent is to leverage existing commercial system development,” she said. That confidence that a commercial satellite bus could serve as the backbone for the Gateway is based on earlier work NASA has done with industry. In November, NASA awarded studies to five companies — Boeing, Lockheed Martin, Orbital ATK, Sierra Nevada Corporation and Space Systems Loral (SSL) — to examine technical issues associated with the PPE design. Those four-month studies left both NASA and industry confident that commercial designs can be adapted for use in building the PPE. “One of the things that we looked at is how do we incorporate our different product lines into the PPE. It’s very much focused on commercial components and systems,” said Tim Cichan, a space exploration architect at Lockheed Martin, during a panel discussion at the American Institute of Aeronautics and Astronautics (AIAA) Propulsion and Energy Forum in July in Cincinnati. 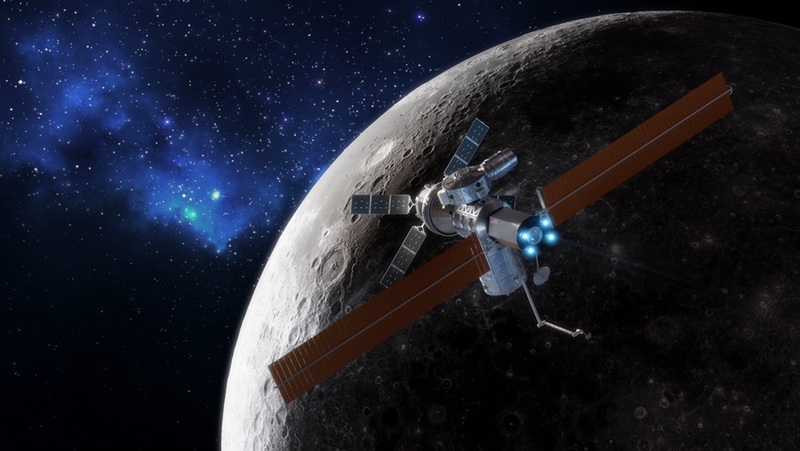 Cichan said Lockheed’s studies based the PPE on its LM2100 satellite bus used for commercial satellites, but also drew on the company’s experience developing interplanetary spacecraft for NASA and the Orion spacecraft under development for transporting astronauts beyond Earth orbit. He added the company has extensive experience with electric propulsion, such as on its LM2100 bus, although not to the same scale as planned with the PPE. SSL is also planning to make use of its extensive experience in commercial satellites to develop the PPE. Al Tadros, vice president for space infrastructure and civil space at SSL, mentioned that experience during the AIAA panel, but also the company’s more recent work on satellite servicing systems. Northrop Grumman Innovation Systems — the new name for Orbital ATK after its acquisition by Northrop Grumman closed in June — wanted to ensure that its design for the PPE made use of technologies from its commercial GEO satellites as well as its Mission Extension Vehicle, a spacecraft designed to extend the life of other GEO satellites. Richardson said her company’s concept is based on a version of its Mission Extension Vehicle called the Mission Transportation Vehicle. “We see the PPE opportunity as one that will bring us from the markets in LEO and GEO and enable us to expand our mission portfolio out to cislunar space and beyond,” she said. Among the five companies that studied the PPE concepts, Sierra Nevada stands out as the only one without experience building GEO satellites. The company has built smaller LEO satellites, including the second-generation Orbcomm satellite constellation, but doesn’t have the experience of building large numbers of GEO buses like the other firms included in the earlier studies. Sierra Nevada is instead taking advantage of its experience on NASA’s commercial cargo program, where it has a contract to develop a version of its Dream Chaser spaceplane to ferry cargo to and from the International Space Station. That system will include an additional cargo module attached to the Dream Chaser. Besides leveraging commercial technologies, NASA both NASA and the companies want to handle the actual procurement of the PPE differently. “NASA has very intentionally and very significantly looked at doing this acquisition differently,” said Tadros. NASA doesn’t plan to use a convention procurement process, involving a request for proposals and selection of a winning bidder who then provides the specified hardware for NASA. The agency is instead using an alternative mechanism, called a broad agency announcement (BAA), typically used for research and development efforts rather than hardware acquisition. NASA issued the final version of the BAA Sept. 6, with proposals due to the agency Nov. 15. Strictly speaking, the BAA doesn’t acquire the PPE, at least not initially. Instead, the BAA is for a “Spaceflight Demonstration of a Power and Propulsion Element.” The company — or companies — that receive an award under this program will be responsible for developing and launching the PPE, then demonstrating its performance in cislunar space for up to a year. At the end of that one-year demonstration period, around the time NASA anticipates launching additional components of the Gateway, the agency can then exercise an option in the BAA to acquire the PPE. That approach required some effort within NASA to adapt the BAA concept to this project. “The legal and contracting teams did a really good job,” Gerstenmaier said at the NASA Advisory Council meeting, calling it a “deviated” BAA with the inclusion of a few NASA-specific requirements and option to acquire the PPE after the demonstration period. “We were able to take a very strict contracting construct, and with two simple deviations, we were able to turn that around into a product we could actually use and move forward,” he said. But is this a trend or a one-off case? NASA is still working on its acquisition strategy for the Gateway, including determining which components will be provided by international partners, which will be built through more conventional contracting and which could be done in a more commercial manner like the PPE. At the same time, the Gateway itself has become a larger, more complex vehicle. When NASA rolled out plans for what was then called the Deep Space Gateway in 2017, the spacecraft was minimalistic: a PPE, a habitation module, a logistics module and, maybe, an airlock. Since then, in large part due to talks with international partners, the Gateway’s design has grown to include a second habitation module and additional “utilization” modules for habitation, storage or other work. 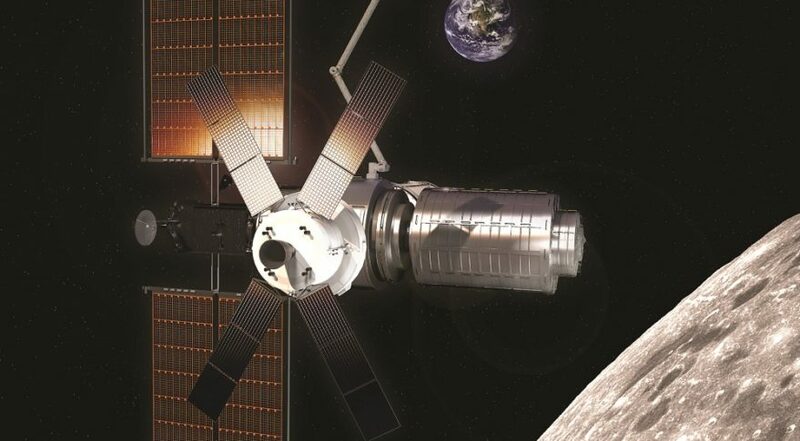 Some in industry have suggested another opportunity to do a more commercial procurement may be for the U.S. habitation module for the Gateway. Several companies have NASA-funded studies in progress about developing habitation modules for the Gateway, including development of prototypes for ground-based testing. In some cases, companies made clear their interest in developing not just a single habitat module for the Gateway but also commercial modules for the ISS or its private-sector successors. NASA’s leadership appears open to greater commercial partnerships. 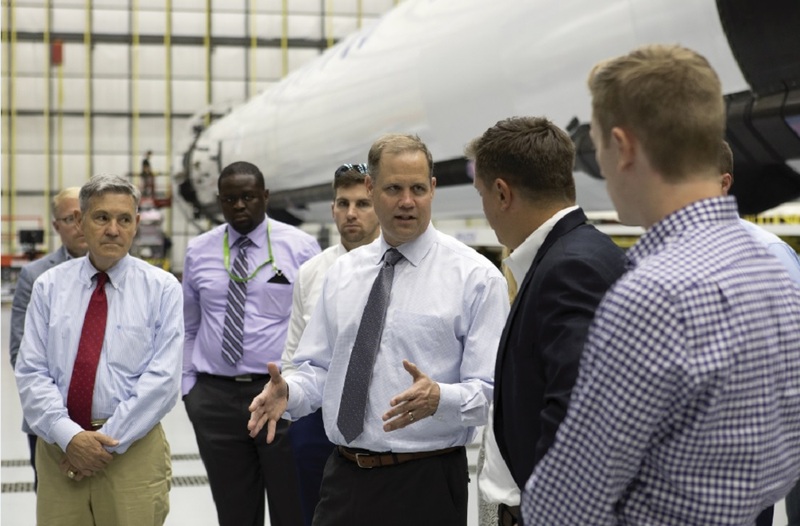 At the council meeting, NASA Administrator Jim Bridenstine announced the formation of a new committee within the council focused on regulatory and policy issues, and chaired by Gold. Its scope will include studying potential obstacles to greater cooperation with the private sector and use of commercial capabilities.